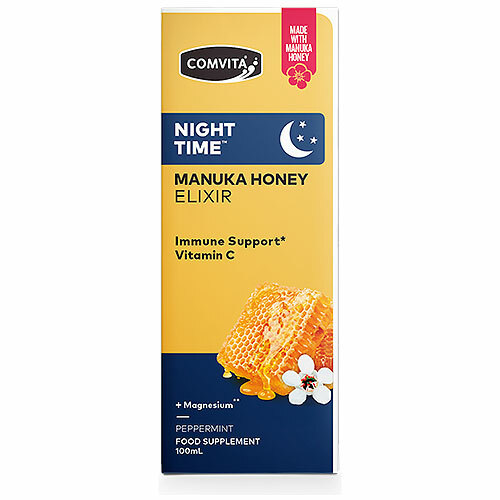 Night Time™ Manuka Honey Elixir contains three New Zealand Honeys; Manuka, Thyme and Rewarewa combined with Vitamin C and Magnesium. Magnesium contributes to a reduction of tiredness and fatigue and the normal function of the nervous system. Adults and children over 3 years: Take 10ml (2 teaspoons) up to 20 ml in an evening. Not to be given to children under 3 years of age. Do not exceed recommended daily intake. Shake well before use. Below are reviews of Comvita Manuka Honey Elixir Night Time - 100ml by bodykind customers. If you have tried this product we'd love to hear what you think so please leave a review.